Yes, I am still here... It's been a while, we had a Spring break (which seems it was just the other day, but it was a month since we've been back actually), then I was distracted by some quilting I just *had* to do, and then I was just, well... uninspired. So, instead of drafting and sewing I was playing around with some thing 'related' to this project. I was learning new tools for making fashion flats, I figured out how to make pattern pdf-s for printing more easily, I have been doing just a bit of fabric shopping and finally last week I have been doing some sewing. OK, so let's get to this new challenge. 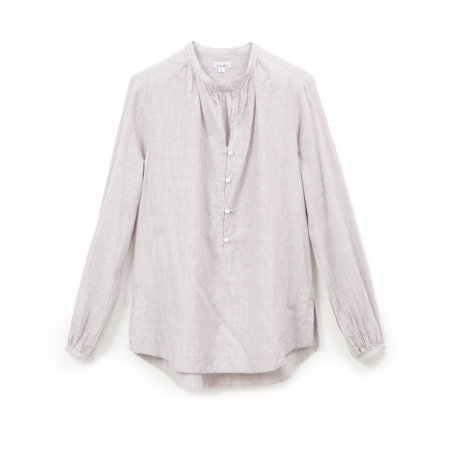 A shirt - specifically this shirt below, Sydney Top from Steven Alan. It has a few interesting details - gathering around the neck (done that, should not be a problem), slit neckline (done that too, except this one comes with buttons so that will be interesting), yoke (done), and a few new things - collar, shirttail hem with slits and shirt (relaxed) sleeves. This time, since the basic design is different from Block 1, which is more fitted, I will go back the basic bodice. Let's start with the back first. In a nutshell - since this is a relaxed fit, I will make the arm opening wider as well. So we need to move the shoulder dart into the arm opening, draw in a yoke and do some other minor adjustments like the length, and the neck, side and hem shaping. 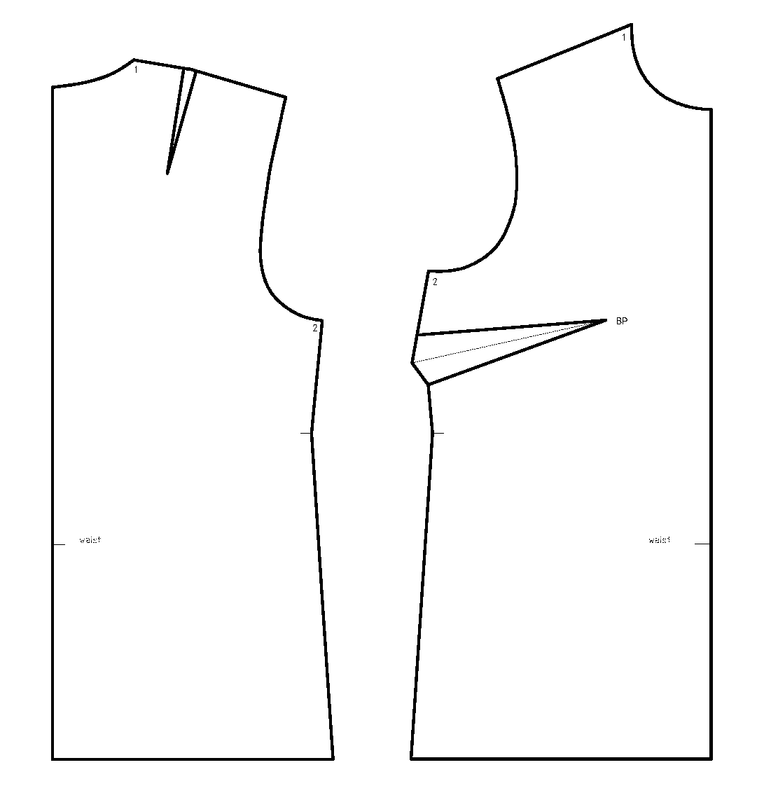 To copy the pattern with the modifications... trace around your block from the left dart leg, around the neck, along the midline, waistline, up the side seam and along the arm opening until you reach the point where the line you drew touches the arm opening (you can also look here for a more detailed drawing). Put a pin in the tip of the dart, and rotate counterclockwise until the right leg of the dart, touches the original position of the left leg (basically you are "closing" the dart). 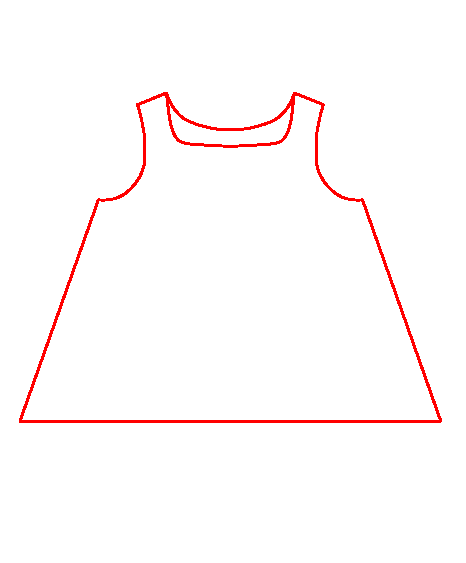 Now trace around the the top right corner of the bodice, the one you did not trace around in the previous step. The picture below shows what you end up with. Since the shoulder line is not straight, fix it by drawing a straight line from the neck to the shoulder point. Also, divide the opening of the new dart into 3 equal parts. Two parts will be added to the arm opening, one part will be used for shaping of the yoke. Now, add 1.5 cm to the width - this is a relaxed fir after all, and add as much length as you wish - in this case I added 24.5 cm from the waistline. I also added 1cm to the shoulder width, dropping the shoulder slightly (again, the relaxed fit) and deepened the arm opening by 1 cm down the side seam. Draw a new arm opening. Almost forgot - I deepened the neckline slightly. Personal choice, not really necessary. Draw a new hemline (here I used an old shirt I had; I liked the curve on it). Also, make sure that the width at the hip (of your shirt goes past the hipline) is at least H/4 + 2cm, where H is your hip measurement in cm. This is basically to make sure that there is enough room at the hip. For me, it worked out that I was right on the mark - I did not have to add any shaping to the side seam. Finally, draw in the yoke: extend the horizontal line you drew in for the "new" dart - this will be the bottom of the yoke. For a bit of back shaping, and better drape, curve the back (bottom of the pattern) slightly so that the opening at the arm is about the same as the 1/3 of the dart opening. OK, now on to he front part of the pattern. Since this one is more complicated, I first made a copy of it - on the copy I deepened the neckline a bit (see the pic below). I also measured the amount of the dart that will be blended into the arm opening. There is an error on the picture below - it should say 2A not A. If you look on an earlier picture above, the back dart was divided into three parts, and A is a "width" (measured at the arm opening) of one part or 1/3 of the dart. 2/3, or 2A was blended into the back arm opening, so the same amount needs to be blended into the front arm opening to keep the balance between the front and back. The shaded part of the dart will be moved into the neck to get the gathers. There is a little bit of a "V" opening at the neck, so I took 1.5 cm at the neck opening and drew in the "V" down to about 6 cm from the bustline. Cut along that line. Now, draw in the yoke - I chose mine to be about 4 cm from the shoulder seam. When we're done moving the dart, we will cut this out and tape it to the back yoke, to get one pattern piece. Then, divide the remaining neck into three equal parts (points A and B) and draw lines from those points to BP (bust point). I will do the rotation again, but you could also cut along those lines, cut the dart out and open equally at A and B.
Divide the dart to be moved (the shaded part) into two sections (points 1, 2 and 3). Trace from point 1 counterclockwise around the pattern all the way to point A. Put a pin in the tip of the dart and rotate the pattern counterclockwise until point 2 overlaps touches point 1. Trace the pattern from A to B. then rotate once more, until 3 touches 1 (now the dart is closed), and then trace from B around all the way to point 1. This is what you end up with ... a very un-smooth neckline. So, smooth it. 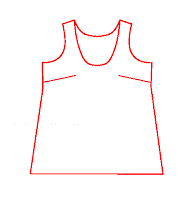 Add 1 cm to the shoulder length (to match the back) and deepen the armhole by 1 cm at the sideseam. Also, add 1 cm to the width, and the length from the waist to match the back. Draw a new arm opening. If the shirt extend beyond the hipline, make sure that the width at the hipline is at least H/4 + 3cm, where H is your hip measurement. Again, in my case I was straight on, so I did not need to do any side shaping. Shape the hemline - I used the same curve as for the back. Since the neckline will be slit and there will be buttons we need to draw in the lapel. I chose it to be 2 cm wide, and to extend all the way to the waist. I used the actual buttons I will use of the shirt to mark button positions. Finally, tape the front and back along the shoulder line, and check the neck and arm curve - make sure it is smooth along the shoulder seam; smooth if necessary - i needed to fix the neck curve - see below. Cut the yoke out and you have the basic three pattern pieces - front, back and the yoke. Next we will draft the sleeve and the collar.